In a very large, enameled cast-iron casserole, melt 3 tablespoons of the butter in the olive oil. Add the onion and cook over moderate heat, stirring occasionally, until just softened, about 5 minutes. In a small bowl, crumble the saffron into 2 tablespoons of hot water and let stand for at least 10 minutes. Season the lamb shanks with salt and black pepper and dust with paprika. Add the lamb shanks to the casserole and cook over moderate heat, turning occasionally, until the shanks are well browned, about 7 minutes. Stir in the 1 tablespoon of paprika, the cumin and cayenne and cook, stirring, until fragrant, about 1 minute. Add the tomatoes and 3 quarts of water and bring to a boil over moderately high heat. Skim off any fat and add the saffron and its soaking liquid, the parsley bundle and a large pinch of salt. Reduce the heat to low, cover partially and simmer until the lamb is tender, about 2 hours. Transfer the lamb shanks to a large plate and cover with foil. Add the potatoes, celery and carrots to the casserole, cover and simmer over moderate heat until almost tender, about 10 minutes. Add the red peppers and zucchini and simmer uncovered until all the vegetables are tender, about 10 minutes longer. Remove from the heat and discard the parsley bundle; set aside 1 cup of the cooking liquid. Stir in the frozen peas. Remove the meat from the lamb shanks and cut it into 3/4-inch pieces. Return the meat to the stew. In a large saucepan, melt the remaining 1 1/2 tablespoons of butter. Add the couscous and cook over moderate heat, stirring, until lightly toasted, about 3 minutes. Stir in 2 cups of water, the reserved 1 cup of cooking liquid and a large pinch of salt and bring to a boil. Cover, remove from the heat and let stand until the liquid has been absorbed, about 10 minutes. Fluff with a fork. Season the lamb stew with salt and pepper. Mound the couscous on a large, high-sided platter. Ladle one-third of the lamb and vegetables around the couscous and moisten with a little of the cooking liquid. 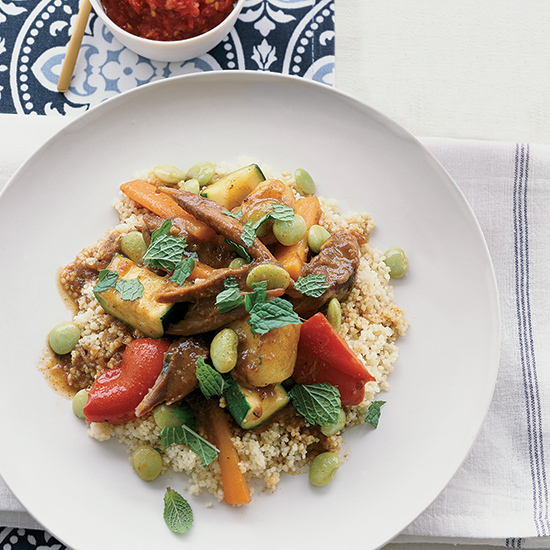 Sprinkle the lamb stew and couscous with the mint and serve the remaining stew on the side, passing the harissa at the table. The lamb stew can be made through Step 4 and refrigerated for up to 3 days; reheat gently. Make the couscous just before serving. The stew can partner well with a rich, firmly structured red wine such as Merlot from Sonoma County.